If you are a snowmobiling enthusiast, the state of Maine boasts some of the best trails around. There are over 14.000 miles of marked and groomed trails known as the ITS, or Interconnected Trail System. Trails are created and maintained by snowmobile clubs, local municipalities, businesses, and land owners. These trails offer breathtaking views of the many lakes, mountains, forests and wildlife that Maine has to offer. The season generally runs from December to March. The most popular destinations for sledders are Jackman, Moosehead Lake, the Katahdin Region, Rangely Lakes, and Aroostook County. The Katahdin Region consists of Patten, Millinocket, East Millinocket, Lincoln and Howland. Wonderfully scenic views of Mt. Katahdin are sure to be a crowd pleaser. The area was one of the first to cater to snowmobilers. Because Millinocket has such a varying terrain and snow conditions can change from day to day, Polaris decided this would be the perfect place to test their machines. Many of the early prototypes were left behind and locals have been enjoying the activity ever since. The Jackman area consists of Jackman, Moose River and many unorganized territories. Known locally as the Switzerland of Maine, it is said to be where the snow falls first and leaves last. Moosehead Lake Region consists of Greenville, Sandy Bay, Lily Bay, Beaver Cove and Lake Hebron. Snowmobile clubs are plentiful in this area and there are ample opportunities for recreation both on and off the trails. Local trails connect to the ITS enabling riders to explore other parts of Maine, New Hampshire, and even Canada. Rangely Lakes, known as Maine’s Four Season Playground, lies in the western mountains of Maine. Trails here connect to all points north, south, east, and west, including the 260 mile international circuit through Canada. Aroostook County is the northernmost county in the state. It is considered to have the best trail riding experience in the eastern United States and was named one of the top ten best places to snowmobile in North America. Snowfall is plentiful here and usually measured in feet rather than inches. First and foremost, safety should be considered when heading out on the trails. Maine winters can get bitterly cold so proper clothing is essential. Outer layers should be windproof and waterproof. Clothing should be worn in layers. Do not wear long scarves or loose clothing as they can get caught in moving parts of the machine. Emergency supplies such as spare spark plugs, waterproof matches, rope, a knife, extra clothing, and a first aid kit, should be carried at all times. Be sure to also have a working flashlight with extra batteries, spare fuel, and a map of your route. Checking the battery, headlights and fuel levels before you leave can prevent unpleasant surprises later. Stay on marked trails whenever possible and use extreme caution when crossing bodies of water. Lastly, let family or friends know where you will be traveling and when you expect to return. There are also some rules and regulations riders should familiarize themselves with before setting out on a trip. 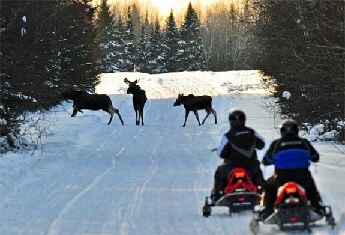 To ride on the trail system, residents and non-residents are required to register their sleds in Maine. Approved helmets must be worn at all times. There are restrictions as to where you can ride too. Snowmobiles are not allowed in cemeteries, on a plowed road, or along railroad tracks, for example. Maine’s tough OUI laws apply when operating a snowmobile. These are just a few things to keep in mind before hitting the trails. With an average annual snowfall of over 100 inches, snowmobiling has become a large part of Maine’s economy. Restaurants, hotels, gas stations, equipment outfitters, tour guides, and repair shops, can all be found within close proximity to trails. Many areas hold events specifically geared toward sledders. One such event is an antique snowmobile parade in Millinocket. Part of the towns Winterfest Festival, the parade showcases some of the most unique snow machines around. Another event growing in popularity is snowmobile drag racing. Races are held around the state and riders come from across the country to participate. The Maine Snowmobile Association is a great resource for those considering a trip to Maine. Here you will find information on trails, applicable laws, lodging, upcoming events and a host of other helpful information. Snow sledding season is nearly upon us. With common sense in tow, a little research, and some preparation, you will be ready to explore the vast beauty Maine has to offer. Let it snow, let it snow, let it snow!